The Village of East Aurora, New York will again appear in a holiday themed movie. Fred and Chris Olen Ray, Director and Producer respectively, are back in town to shoot their latest motion picture entitled “A Special Christmas Dinner”. The father-son team are Hollywood based, and have shot several movies in Western NY and East Aurora including the popular Christmas movie “A Prince for Christmas” shot and released in 2015. The movie crew will be shooting this Tuesday, March 26th mostly along Main Street and inside Vidler’s. Main Street merchants are asked to help by displaying holiday decorations for that day. The Buffalo Niagara Film Office would like to thank the Village of East Aurora, Mayor Peter Mercurio; Village Administrator, Cathie Thomas and the village Department of Public Works and Police Department for their assistance. The Greater East Aurora Chamber of Commerce is working closely with the Buffalo Niagara Film Office and the movie team to coordinate the shoot. The Chamber continues to be active in efforts such as this that help create a vibrancy which attracts shoppers and visitors to support our local business community. The Greater East Aurora Chamber of Commerce is presenting a panel of 6 local employers in various industries to talk about career opportunities in their respective fields. 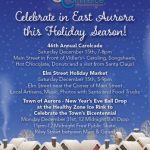 The event is free and will be held Wednesday, January 23rd, 7 – 8:30pm at Absolut Care of Aurora Park, 292 Main St., East Aurora. This presentation is open to the public – parents, students, educators, and businesses. Enter the building through the Rehab facility toward the rear of the building. Panelists will discuss exciting opportunities in the skilled trades, auto service & repair, welding, health care and manufacturing fields and the skills needed in entering the workforce in general. Prior registration is not required. For further information contact the GEACC @ 652-8444. Chamber Gift Certificates – Great Gift! – Supports Local Merchants! CHAMBER GIFT CERTIFICATES ARE A GOOD HOLIDAY GIFT THAT SUPPORTS LOCAL BUSINESSES! The holiday season is upon us! While shoppers make out their holiday lists, one great option is a Chamber gift certificate. The popular certificates are treated like cash for purchases. 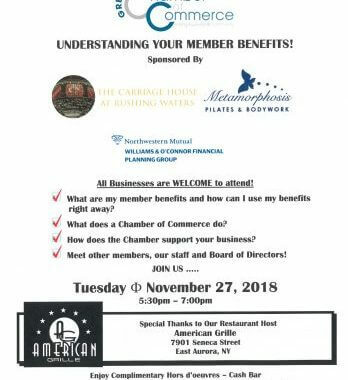 The gift certificate program was developed by the Chamber as a way to support local businesses by keeping customer dollars in the greater East Aurora area. Over 100 businesses participate in the program. The certificates are great gifts for mail carriers, babysitters, teachers, bus drivers, family, friends and employees. 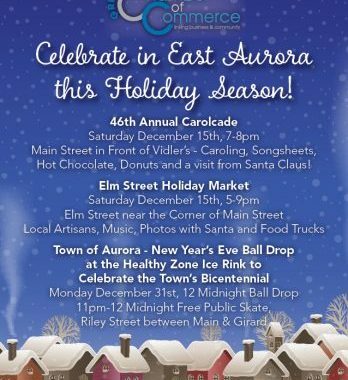 The certificates are sold in $5, $10 and $25 increments at the Greater East Aurora Chamber, and the purchaser is provided with a list of over 100 merchants at that time. 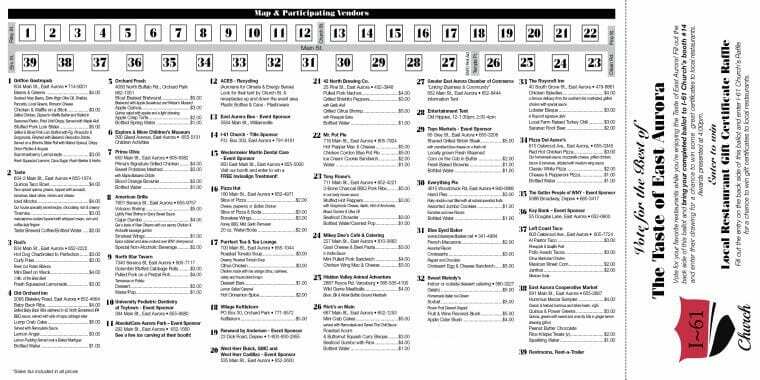 A complete listing of gift certificate participants can be viewed by visiting the Chamber website at www.eanycc.com and going to the member directory section, or simply contact the Chamber Office at 652-8444, or stop in at our office at 652 Main St, East Aurora. Office Hours are Monday-Friday; 8am-4:30pm. The Chamber Office will be open special hours for Small Business Saturday, November 24th, 10am-2pm. 5 Reasons to Join Us For Chamber Business Awards & Hall of Fame Induction! Top 5 Reasons to Attend Next Week’s Chamber Awards! 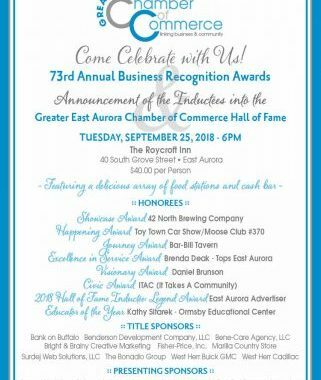 Next Week Tuesday, September 25th the Greater East Aurora Chamber of Commerce will be recognizing 8 businesses, organizations and individuals for their achievements at 6pm at the Roycroft Inn. Here are 5 reasons why you should be there! 5. You need a fun night out enjoying great food and drink at the Roycroft Inn! 4. Join fellow business associates, educators and government representatives as you network and re-connect! 3. Cheer on friends and colleagues that have had a significant positive impact on Greater EA! 2. See what’s REALLY happening in your community! 1. You will be inspired and motivated! 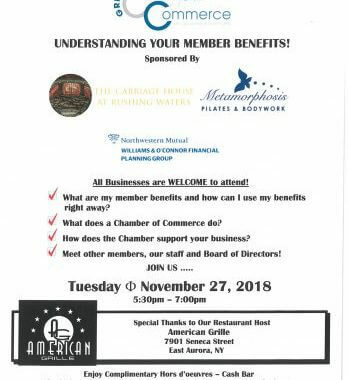 For further information contact the Chamber office at 652-8444. 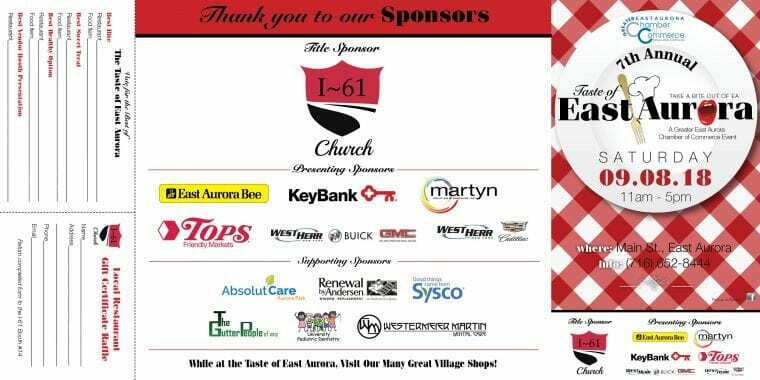 See You Saturday 9/8 For the Taste of East Aurora!